The level of England’s new housing construction activity in the April to June quarter of 2014 was unchanged on the first quarter but up 18% year-on-year. 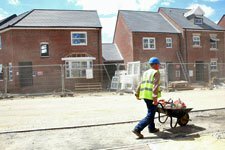 The latest statistics show that there were 36,230 new housing starts in England between April and June. Although this is the same amount that was seen in the previous quarter, it represents an increase of 18% on the same quarter last year. It brings the total number of starts over the last 12 months to 137,780, which is a 22% increase on the previous year and the highest level of house building since 2007. The government said that the construction sector had now been growing for 15 consecutive months, and is currently experiencing the sharpest rise in house-building orders since 2003. Companies are taking on new workers at the fastest rate since 1997, it said. Seasonally adjusted house-building starts are now 112% above the trough in the first quarter of 2009 but remain 26% below the last peak seen that was seen in the first quarter of 2007, just before the bubble burst. Seasonally adjusted completions are estimated at 29,540 in the second quarter of 2014, 6% higher than the previous quarter and 7% higher than the same period last year. Last year successful applications for major housing schemes were up 23%, and planning permission was granted for 216,000 new homes. Housing minister Brandon Lewis said that the figures were evidence that the government’s long-term economic plan to improve the housing market is working. “improving the housing market will remain a vital part of our long-term economic plan”.